Australian mare Ortensia came from almost last to first with a remarkable late run to lift the Coolmore Nunthorpe Stakes at York. Paul Messara's seven-year-old was at least 10 lengths behind the leader at the halfway stage of the five-furlong Group One. However, William Buick retained the coolest of heads as he pushed her up the far side of the track and the well-backed 7-2 joint-favourite collared Spirit Quartz in the shadow of the post to collect by a neck. Buick said: "It's fantastic, I don't know how she won, to be honest. They went very fast and I was a long way back, but I could hold a straight course the whole way and she's so much better when she doesn't have to be switched in or out. "You could see the way she finished the race she's got so much speed and I think if she steps back up to six (furlongs) again, she'll be very hard to beat. "I don't think I've been quicker in a race before and they just got her off the bridle, but when she gets to the furlong and a half marker she hits that sixth gear and picks up well. "The ground is a little bit loose, so that probably didn't help her early on - we were kind of wheelspinning a bit. She showed at Goodwood what she can do to these sprinters and she showed today she's superior to the sprinters over here." Messara added: "It's fabulous. It's the most amazing feel. To win a big one over here is a huge thrill. I couldn't believe it yesterday when it poured down. I thought we were coming here with no chance. 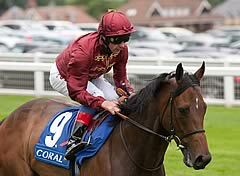 "I walked the track this morning and again thought we didn't have a chance. I just thought it was too soft for her to show her acceleration. Anyway, we're here and she's done it, just." 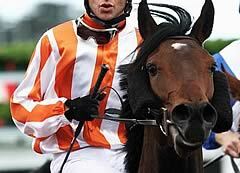 Messara confirmed that Ortensia is now likely to head for the Betfred Sprint Cup at Haydock on September 8.